High-Tech Factory, Shizuoka, Sekisui House Ltd. Karen Manley, Author provided. Factory production means modular green buildings are better sealed against draughts, which in conventional buildings can account for 15-25%of winter heat loss. For example, factory built houses in Japan have performed very wellduring earthquakes, with key manufacturers reporting that none of their houses were destroyed by the 1995 Hanshin Great Earthquake, as opposed to the destruction of many site-built houses. Sorting waste at Sekisui House Ltd Recycling Centre. Karen Manely – Author provided. Imagine it’s Valentine’s Day and you’re sitting in a restaurant across the table from your significant other, about to start a romantic dinner. As you gaze into each other’s eyes, you wonder how it can possibly be true that as well as not eating, your sweetheart does not – cannot – love you. Impossible, you think, as you squeeze its synthetic hand. Could this be the future of Valentine’s Day for some? Recent opinion indicates that yes, we might just fall in love with our robot companions one day. Already, robots are entering our homes at increasing rates with many households now owning a robot vacuum cleaner. Robotic toys are becoming more affordable and are interacting with our children. Some robots are even helping rehabilitate special needs children or teach refugee children the language of their new home. Will these appliances and toys continue to develop into something more sophisticated and more human-like, to the point where we might start to see them as possible romantic partners? While some may compare this to objectophilia (falling in love with objects), we must ask whether this can truly be the case when the object is a robot that appears and acts like a human. It is already the norm to love and welcome our pets as family members. This shows us that some varieties of love needn’t be a purely human, nor even a sexual phenomenon. There is even evidence that some pets such as dogs experience very similar emotions to humans, including grief when their owner dies. Surveys in Japan over the past few years have shown a decline in young people either in a relationship or even wanting to enter a relationship. In 2015, for instance, it was reported that 74% of Japanese in their 20s were not in a relationship, and 40% of this age group were not looking for one. Academics in Japan are considering that young people are turning to digital substitutes for relationships, for example falling in love with Anime and Manga characters. If we are to develop robots that can mirror our feelings and express their digital love for us, we will first need to define love. Pointing to a set of common markers that define love is difficult, whether it be human-to-human or human-to-technology. The answer to “what is love?” is something that humans have been seeking for centuries, but a start suggests it is related to strong attachment, kindness and common understanding. We already have the immensely popular Pepper, a robot designed to read and respond to emotions and described as a “social companion for humans”. How close are we to feeling for a robot what we might feel for a human? Recent studies show that we feel a similar amount of empathy for robot pain as we do human pain. We also prefer our robots to be relatable by showing their “imperfect” side through boredom or over-excitement. According to researchers in the US, when we anthropomorphise something – that is, see it as having human characteristics – we start to think of it as worthy of moral care and consideration. We also see it as more responsible for its actions – a freethinking and feeling entity. There are certainly benefits for those who anthropomorphise the world around them. The same US researchers found that those who are lonely may use anthropomorphism as a way to seek social connection. Robots are already being programmed to learn our patterns and preferences, hence making them more agreeable to us. So perhaps it will not be long before we are gazing into the eyes of a robot Valentine. Human-robot relationships could be challenging for society to accept, and there may be repercussions. It would not be the first time in history that people have fallen in love in a way that society at the time deemed “inappropriate”. 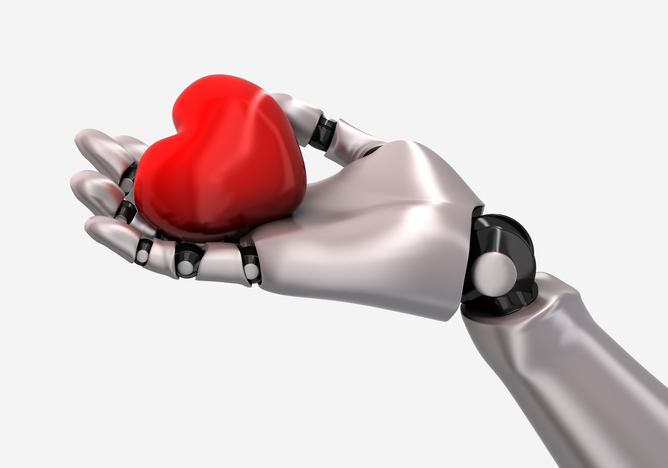 The advent of robot Valentines may also have a harmful effect on human relationships. Initially, there is likely to be a heavy stigma attached to robot relationships, perhaps leading to discrimination, or even exclusion from some aspects of society (in some cases, the isolation may even be self-imposed). Friends and family may react negatively, to say nothing of human husbands or wives who discover their human partner is cheating on them with a robot. One question that needs to be answered is whether robots should be programmed to have consciousness and real emotions so they can truly love us back? When love is returned by a robot. Experts such as the British theoretical physicist Stephen Hawking have warned against such complete artificial intelligence, noting that robots may evolve autonomously and supersede humanity. Even if evolution were not an issue, allowing robots to experience pain or emotions raises moral questions for the well-being of robots as well as humans. So if “real” emotions are out of the question, is it moral to program robots with simulated emotional intelligence? This might have either positive or negative consequences for the mental health of the human partner. Would the simulated social support compensate for knowing that none of the experience was real or requited? Importantly, digital-love may be the catalyst for the granting of human rights to robots. Such rights would fundamentally alter the world we live in – for better or for worse. But would any of this really matter to you and your robot Valentine, or would love indeed conquer all? Lost and thirsty in the Australian bush, Outback Joe waited eight years. And finally, in September this year, he was found – by a flying robot. 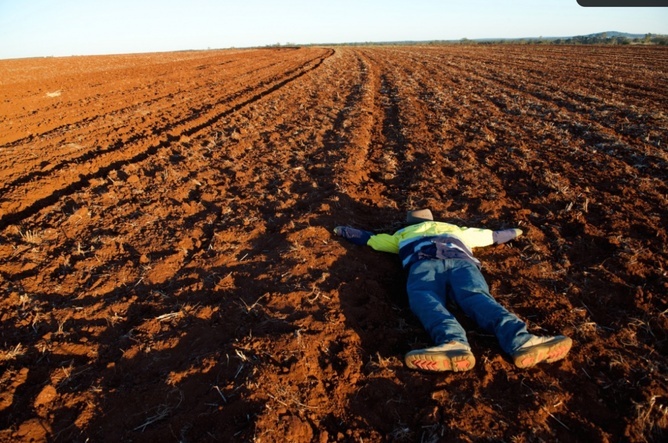 Outback Joe is not a real person, but for a week each September over six of the past eight years, he lay in a field waiting to be found. A stuffed dummy in a high-visibility shirt and Akubra hat, Outback Joe was the target of the Unmanned Aerial Vehicle (UAV) Challenge Outback Rescue, an international robotics competition. Outback Joe has a Facebook page. He’s on Twitter. He likes to go for walks in the country, but sometimes he gets lost. Joe could be you. Outback Joe is lost and has collapsed in a peanut field. He needs to be found, and desperately needs water. Stories in the media about people getting lost are unfortunately common. Some are lost adventurers, but most are not. Typically, it’s the very young who wander off, the elderly who get confused, or the inexperienced, who don’t appreciate just how easily they can lose track of where they are. Searching for the lost is a race against time. We have all seen in the media great successes when the lost are found, but also the tragedies when time runs out. 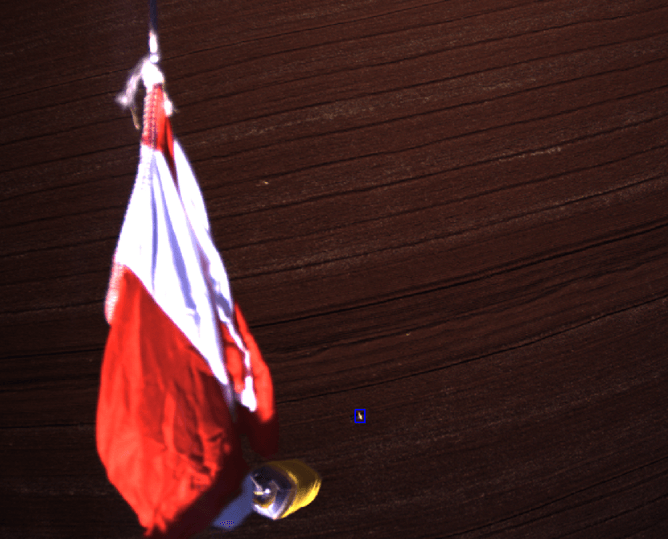 For many years, searching from the air has been a valuable tool, and is required in certain situations. But the opportunity to undertake an aerial search is sometimes limited due to a lack of availability of aircraft or pilots, or practical restrictions such as poor weather. As technological capabilities continue to develop, search and rescue organisations around the world are keen to use robotic aircraft to help find lost people. Known as remotely piloted aircraft in official circles (and more commonly as drones), these aircraft are usually small, cheap to buy – especially compared to traditional aircraft – and somewhat expendable, as there are no people onboard. And that’s where we came in. A group of organisations in Australia launched the UAV Challenge Search and Rescue Competition in 2006, offering a A$50,000 prize for the first team in the world to find and rescue our lost bushwalker, Outback Joe. We specifically developed the competition to guide teams to create low-cost solutions that, one day, could be used for real search and rescue missions. 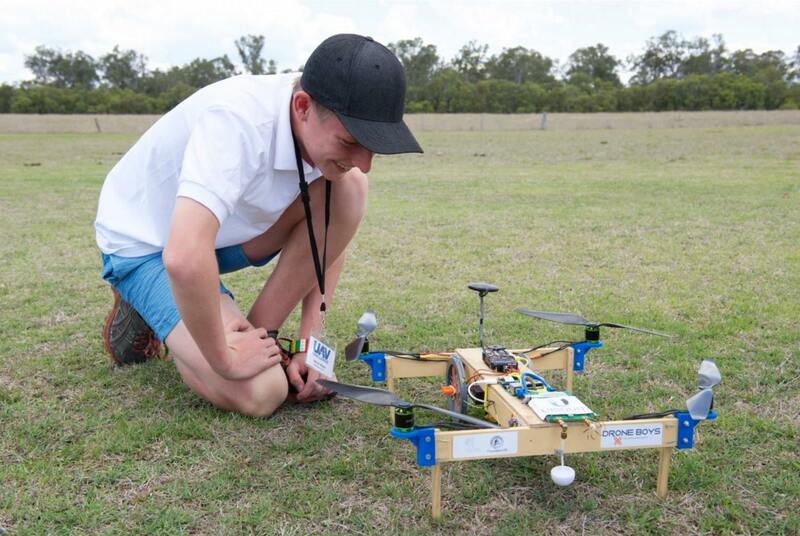 The Challenge required each team to launch their robotic aircraft from Kingaroy Airport, in rural Queensland, and head out to a large search area approximately four kilometres away. A robot aircraft returning from a successful mission to rescue Outback Joe. The aircraft had to cover the search area, locate Joe and drop him a 500 millilitre water bottle, ensuring it landed within 100 metres of his position. The aircraft typically flew for up to an hour, and covered between 50 and 100 kilometres of ground during the search. The UAV Challenge was a true challenge – it wasn’t something that would be completed overnight. In fact, it was a rescue mission that kept 350 teams and more than 2,000 team members busy for eight years. Some teams came close as time went by, but it wasn’t until 2014 that a team of passionate enthusiasts from Canberra finally won the grand prize. Three other teams also completed the Challenge successfully this year. The secret to the winning entry was their accuracy of the water bottle drop. The aircraft automatically flew a special pattern around Outback Joe’s location to estimate the wind direction. The on-board computer then calculated the best flight path over Joe taking into account the wind. The result was spectacular, with the water bottle landing just 2.6 metres from Joe. The moment just before CanberraUAV dropped a water bottle on a parachute to Outback Joe. Outback Joe is in the blue rectangle. So did the UAV Challenge do its job and drive down the cost of producing highly capable robot aircraft for search and rescue and inspire innovation in the field? Happily, I think the answer is yes. The teams that successfully completed the mission did so using specifically designed electronics and new autopilot technologies (which, incidentally, were inspired by the UAV Challenge itself). One radio communications device developed by a Brisbane-based company has now sold several thousand units worldwide. Another company, based in Adelaide, developed a safety system for teams that has been commercially successful around the world. The open source software movement embraced the UAV Challenge, seeing three of the most widely used low-cost autopilot developers enter the event. In 2014 alone, software for two of these auto-pilots has been downloaded more than 170,000 times by users across the globe. Flying robots with an automatic search ability could assist Australian State Emergency Services to make rescues more efficient. The dream of search and rescue organisations is that in the near future they will be able to have small fleets of robot aircraft, each costing no more than a few hundred dollars, stored and waiting for the day they can be used to save a life. We know this will be possible, in time. The UAV Challenge has demonstrated that – and Outback Joe lives to tell the tale of that time he got lost in the bush. Jonathan Roberts is a co-founder of the UAV Challenge Outback Rescue. Education minister Christopher Pyne has given his strongest indication yet that university fees will be deregulated, removing the cap on what universities can charge students. In a speech at The Policy Exchange in London, Minister Pyne declined to pre-empt any budget announcements, but emphasised the deregulatory nature of the Liberal government and insisted universities need more autonomy. Pyne said the government had already started this process by removing “burdensome” regulations and reporting requirements, and assured they would continue steps to “set higher education providers free”. Speculation has grown that the government will remove caps on students fees since the release of a report by David Kemp and Andrew Norton, which said the demand-driven system for university places was a net positive, but continued funding may require a rise in student fees. “Government investment alone is not enough to ensure a well-functioning higher education sector,” Pyne said. He said Australia’s universities had much to learn from those in the US, with uncapped student fees meaning greater competition and thus higher standards in the sector. He said the competitive nature of US universities bred a focus on competition for students and student loyalty towards the institutions, which he said often translated into philanthropic donations after graduation. He quoted University of Adelaide Vice-Chancellor Warren Bebbington who said Australia’s higher education system has the opportunity to be as diverse as the States’, but “without the crippling debts”. Putting students further into debt and decreasing the equity of the system are the main reasons for opposition to fee deregulation, but Pyne said providing tertiary education at a high standard with a competitive approach meant students would “win out”. La Trobe University Vice Chancellor John Dewar said given that the government was unlikely to increase spending on higher education, an obvious source of funding would be to increase the proportion of cost that students contribute themselves. Over the last 20 years, government investment per student has steadily declined under both parties in government, Dewar said. Universities have managed this by expanding rapidly, he said, first, on the back of the boom in international enrolments during the 2000s; and then, from 2009 onwards, through the growth brought about by the demand driven system. “This dynamic of growth cannot continue – there is now very little unmet student demand locally; the international market is unpredictable; and increased government investment in higher education per student does not seem likely. “A deregulation of fee setting is an obvious next step for a government with a deregulatory agenda,” he said. Dewar said if this was to take place it was vital there was a comprehensive scholarship scheme in place for students who might otherwise be deterred from coming to university by increased charges. Vice-Chancellor of Queensland University of Technology Peter Coaldrake said the US system illustrated both the promises and pitfalls of deregulation. “It is not itself a deregulated system, instead it is a sprawling mix of different types with persistent problems with quality alongside the strongest research institutions in the world. “The task for us is to take what can be beneficial and to avoid the downsides,” Coaldrake said. He said the emphasis in reform should not be on what institutions or even policy makers might want the sector to look like, but on what present and future students needed. Co-author of the demand driven system review Andrew Norton said it looked like a key recommendation of his review, to open eligibility to Commonwealth supported places to all domestic students wherever they study, would be accepted. One reason for implementing that recommendation, Norton said, was to encourage competition between higher education providers should fees be deregulated. “While average fees will almost certainly increase if their current legal maximum levels are lifted or abolished, it is important that reasonably priced options remain available. “While some students may be happy to pay a premium to attend a top 50 global research university, there is no evidence that research-intensive universities in Australia do a better job with teaching. “Students should carefully compare the costs and benefits of different higher education options,” he said. Higher education policy analyst Hamish Coates said pricing was a complex issue personally, socially and financially, and the higher education sector needed to “unlock new dollars” to be internationally competitive. How this is managed is where it would get difficult, he said, because a close eye had to be kept on equity. Research and media attention has usually focused on possible negative impacts of video games. But a clear case to support such links is yet to emerge and even people who argue that video games have a negative impact acknowledge that any such effect size is relatively small. Now, there’s an emerging body of research focusing on the potential positive influences of video games. Our research group conducted a comprehensive review of research papers and reports from around the world to explore the role of video games in young people’s lives. We are interested in both gaming and positive psychology, so our aim was to investigate the current research linking video game play and flourishing mental health. We reviewed over 200 papers and mapped relevant connections and associations. We found that playing video games positively influences young people’s emotional state, vitality, engagement, competence and self-acceptance. And that it’s associated with higher self-esteem, optimism, resilience, healthy relationships and social connections and functioning. Clearly excessive video game play and technology use is not good for mental health and we acknowledge that excessive play is associated with negative outcomes, such as anxiety and insomnia. But the overall picture turns the view that playing video games makes us socially isolated, aggressive, and lazy, on its head. Instead, our research suggests that, in the majority of cases, video games can actually contribute to three different aspects of young people’s well-being – emotional, social and psychological. people who play video games in moderation have significantly less depressed mood and higher self-esteem (compared to those who don’t play or who play excessively). Emerging research suggests that how young people play, as well as with whom they play, may be more important in terms of well-being than what they play. Feelings of relatedness or flow while playing, and playing with people you know are better predictors of well-being than the genre of game played. Our research opens the door to using video games in approaches to well-being. Translating this research into practical guidelines about gaming and well-being that can be used by parents and professionals is critical. There are several ways of doing this. One is a “well-being rating system” that we are developing for games. In contrast to existing rating systems, which highlight negative aspects of games, such as violence or offensive language, our rating system identifies their likely positive influences, such as which games are likely to foster teamwork and connections with others. We know that video games captivate their audience, with more than 95% of Australian homes with children under the age of 18 owning a device for playing them. Our research provides an opportunity to use video games as a way to empower young people to manage their own mental health and well-being, and potentially circumvent psychological distress. Key questions remain for future research including identifying what constitutes a healthy or moderate amount of play for people at different stages of their lives and how best to leverage the well-being benefits of video games in a therapeutic setting. It’s one of the key challenges of our generation: transforming our global energy use from emissions-intensive, non-renewable fossil fuels to low-carbon, sustainable energy technologies. The challenge for the transportation sector is particularly acute. Technology options are limited, consumers are diverse and there are stringent quality requirements (think about jet fuels). While global demand for transportation fuels continues to grow, easily-extractable crude oil reserves are being depleted and much of the new crude oil production capacity in the next decade will come from higher-cost deep water wells and oil sands. Biofuels, unlike fossil-based fuels such as unleaded petrol and diesel, are manufactured from renewable biological materials (also called feedstocks). The public discussion on biofuels in recent years has centred on the narrow food-vs-fuel debate. The reality is that we require a sustainable supply of both food and energy to maintain our quality of life and provide improved opportunities for people in the developing world. First-generation biofuels are produced from mostly plant-based starch, sugars and oils. The sugar produced from crops such as sugarcane and sweet sorghum and from starch-based grains such as maize and sorghum can be readily fermented into ethanol. The oil extracted from oil-seed crops – including canola, soy, Pongamia and Jatropha – and from animal-based tallow, can be converted into a fuel called “biodiesel”. Unfortunately, starch, sugar and oil crops are also used for human consumption and livestock feed and, as a result, there can be competition for feedstocks, particularly in times of short supply. This can affect the price and supply of staple food ingredients. And significant increases in feedstock price can make biofuel production uneconomic relative to existing fossil-based fuels. In contrast, second-generation biofuels use lower-value biomass residues – biological material from living or recently living organisms. Such residues can come from forestry, agriculture, municipal solid wastes or dedicated energy crops. There is a huge range of technologies being developed to produce second-generation biofuels. Fermentable sugars from biomass: Biomass is very resistant to breaking down. The plant has to be pretreated to break open its fibre structure and access the large amount of sugars in its cell wall. Then enzymes are used to convert cellulose into glucose (sugar). Ethanol and a variety of higher-value chemicals can be produced from the fermentable sugars. Thermochemical processes: Under high temperatures and pressures, biomass can produce an energy-rich gas, a solid char or a liquid bio-crude. Each of these products can be used as an energy source, or upgraded into other fuels and chemicals. Algae oils: Algae use sunlight and carbon dioxide to produce oils. Algal oil can be harvested from large-scale open ponds or closed algal photobioreactors. This oil can then be used in the production of fuels and chemicals or as a nutritional supplement. Sugars to oils: Conventional yeasts convert fermentable sugars such as glucose into ethanol. But several organisms, including some algae and yeasts, can convert sugars into oils. These oils can then be used as fuel. Jet fuel production: Aircraft have particular requirements for fuel quality standards and limited alternative fuel options. Many of the world’s leading airlines and aviation companies are working together through the Sustainable Aviation Fuels Users Group (SAFUG) to accelerate the development and commercialisation of sustainable aviation fuels, including biofuels. Members of SAFUG include Boeing, Qantas, Virgin Australia and Air New Zealand. Much has been said about sustainability when it comes to fossil fuels. But how do second-generation biofuels stack up? The variation in feedstocks and production processes means all biofuels have different levels of sustainability. embodied energy: did you get more energy out than you put into growing the crop and the production process? the greenhouse gas reduction benefits of the fuel. Whole-of-system impacts are captured in a life-cycle assessment. Biofuels policy makers have to develop robust methodologies so they can understand how indirect land use change affects sustainable biofuels productions. A number of global organisations, such as the International Standards Organisation and the Roundtable on Sustainable Biofuels, are currently developing sustainability assessment criteria for biofuels. With significant biomass feedstocks – especially in the sugarcane and forestry industries – Australia is well placed to be a leader in commercialising second-generation biofuels. Companies including car manufacturers, trucking operators, airlines, mining groups, fuel distributors, and consumers, are coming out in support of biofuels. But the challenge of transforming our transport energy use is complex. It requires a significant long-term commitment to policy measures that support industry development. With the right policy measures, the uptake of second-generation biofuels in Australia could be rapid – only constrained by our capacity to build new production facilities and supply.